This afternoon my friend Hannah* brought her kids Stevie* and Letty* over to carve pumpkins for Halloween. There were two smallish ones for the children and one very large one for me, as a gift from providing the venue and extra supervision. I had to feel wryly sorry for Hannah*, since at the post-Halloween sales last November she'd purchased a couple of pumpkin carving kits, complete with skeleton hand plastic gloves, wee little plastic-handled saws and tracing wheels, a seed scoop, and so on, and stencils for transferring all sorts of cunning and spooky scenes onto your pumpkin. All these past eleven months she'd been looking forward to her kids executing one of these creations, and what happens? The little saws were effective, sorta, but a kitchen knife worked better. The plastic scoop was useless; I provided a large metal serving spoon instead. And despite all her suggestions and persuasions, the children did not want to use any of the store-bought designs. They wanted to carve classic jack-o'-lantern faces. With triangle eyes and noses. And grinning mouths. And pointy fangs. Alas for us grownups! We forget that what is old and worn to us is fresh and new to the little ones. And when it comes to executing a masterpiece, the young artisan prefers that the design be his own. Even if thousands of others have done the same thing before. And alas for us grownups, in that we're so easily suckered into finishing the nasty jobs when the kids lose patience. Thus it was I who stood stolidly by the sink with the serving spoon, cleaning the goop out of Stevie's* and Letty's* pumpkins when they'd left them hanging with orange strings. This wasn't a task to be finished quickly. Not merely because the variety of pumpkin wouldn't let its innards go without a fight, but also because once nine-year-old Stevie* had his jack carved and done, he was at loose ends and went looking for something else to do. And being a kid who's lived in houses in a perpetual state of renovation since he can remember, he asked, "I can help on the house! What can I do?" Following him into the front hall, I said, "Well, there's these nails in these window jambs here that I can't get out, but I don't think you could, either. I don't have the right tools." "I know! Use a crowbar! My dad always uses a crowbar!" "No, the crowbar's too big. The nails are too close to the wood." "How about a claw hammer? My dad uses that for nails!" "No, tried that. Too big." "What about that?" he asked, pointing to the catspaw pry bar. "That oughta work!" "Well, I've tried that before, and couldn't get the groove to fit around the nail. See?" And I showed him. "Oh," he responded. "But what about . . . ? Do you have . . . ?" And I, ever optimistic and ready to try anything to extract those blasted nails, brought the child whatever he requested. But neither nailpullers, nor scraper blades, nor anything else could he make to work. Told you so. If I can't do it, how can a nine-year-old kid? I had to leave him to it, the guts of Letty's* pumpkin still needing curettage. From time to time Stevie* would call me back to tell him what I thought of new nail-removal ideas. Nope, nope, nope. I'd return to the kitchen, and he kept at it in the front hall. But then: "Kate! I've got it!" Huh? I ran out to see. "See?" Stevie* showed me. "You put the end of the pry bar here, and you hammer it in around the nail like this-- " BANG! BANG! BANG! BANG! " --and it can come out!" Squee-squee-squee!! What a beautiful goshawful noise! By golly, the kid was right! "My dad showed me how to do that! I just remembered! He does it like that all the time!" He did another, and another. I showed him how to insert the blade of a putty knife between the pry bar and the wood so the jamb wouldn't get dented, and how to finish the extraction with the nail puller, which ditto. And he merrily went around the house removing the old vinyl trim nails from the piano windows as far as he could reach. Then he swiped the high step stool out from under his sister in the kitchen, and set up shop under one of the high windows next to the living room fireplace. Fine with me-- she can use the one-stepper to finish carving her pumpkin. I got the stool safely placed and showed him how if he opened the bottom sash he could get at the nails more easily. And again left him to it. So now here's nearly half the stubborn nails removed from three out of five of my piano windows; if Stevie* didn't do the others, it's because he couldn't get at them. And thanks to a kid whose dad is an inveterate remodeller, I've got the technique to get the rest of them out of my jambs and out of my life! Hooray!!! After that, both Stevie* and Letty* went in the front hall and stripped wallpaper. If they hadn't had to go home for supper, they'd likely be at it still. Hannah* says when I'm ready, they'll all come and we'll have a wallpaper stripping party. Fun unlimited! 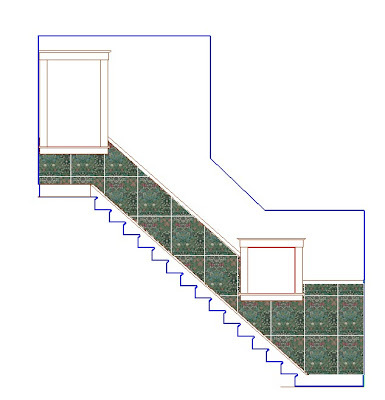 I'm using my student AutoCAD program to work out how much wallpaper I'm going to need in my 1st and 2nd floor stairhalls . . . I hadn't touched the AutoCAD for weeks, nay, for months. It's nice to find I still remember how to do it. Still, the house often refuses to make sense and let itself be drawn up right, regardless of how many measurements I take. I'm telling myself that that's because after nearly 100 years, it's settled down and gotten comfortable and nothing is precisely straight anymore. But I have to wonder if it's just refusing to be confined and defined by something so 21st century as AutoCAD 2008. Here's the view of the stairs from the side. I've dotted in the line of the steps beyond the stringer, and you'll notice they don't track with it. They do in reality, I assure you. I literally spent hours trying to figure out the discrepancy, but gave it up at last. If the house wants to keep some of its secrets, who am I to play the highwayman and insist it stand and deliver? Here's a possible layout for the wallpaper on the west side. Yeah, it's to scale. Overlook the white boundary lines if you can. For some reason, the AutoCAD program puts those around every imported image, and I don't know yet how to get rid of them. Actually, I'm pretty bucked with myself for remembering how to insert a .jpg image in the first place. 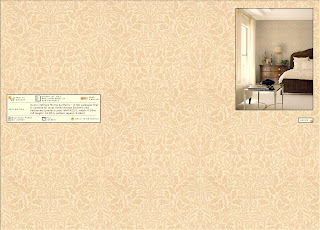 I'm not sure if I'll use the Morris "Acorn" wallpaper above the new wainscot moulding-- it's actually a lot browner than the Internet image and isn't beige what I'm trying to get rid of here? 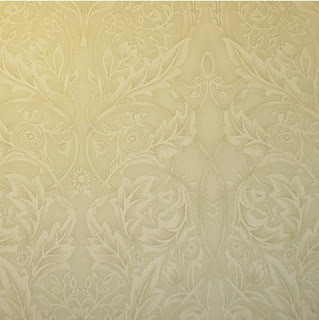 I may do a color wash paint job instead, but it was fun to play with the wallpaper while I was at it. This is as far as I've gotten on the stairhall itself. I think the Morris "Blackthorn" pattern looks really good running up the stairs. I can't order it till Sanderson's sends me the current sample I ordered two weeks ago, but I'm not getting on their case for that. 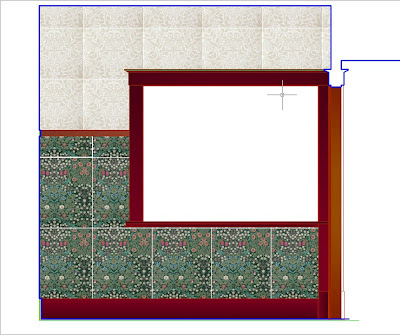 Despite all this jolly computerized drawing, I still haven't used it to calculate how much wallpaper I need. Later, later! I still have woodwork to strip. I've been turning over in my mind the past month or so what I'm going to do with the jambs and heads of the cased openings between my front room and the living room and stairhall. When at some stage the PO-2 (third back before me) converted the front porch to an enclosed room, she made these openings where the front door and the front windows had been. And to cover the face of the 2x jamb and head members, she applied 1/4" veneer plywood to finish the new openings off. Strip and remount the plywood? Don't think so. I did one piece of it, and it had too much paint stuck in the ply edge. And I really dislike the fat reveal that it produces when added to the exposed part of the jamb. The 2x members have a few knots in them, and at the old front door you can see where the strike and hinges used to be. Should I cover that up with a bit of trim that'd sit a ways into the opening? No, because there's some weird irregularities going on with the woodwork between the living room and front room, and I'd have to do some fancy notching to get an applied piece of trim to work. Besides, to look right it'd had to be custom made, and I don't want to get into that. Or do I just clean up the 2x heads and jambs, notch in appropriate shims where the hardware used to be, and trust in the dark garnet shellac I'm planning on using to cover up the patches and knots? I'm pretty well decided on that. So today, I noticed in my basement the 1x jamb and head casings I took off the opening between the kitchen and the dining room, oh, at least four years ago. They covered the actual jambs and head of that doorway, having been added by my POs-1 when they redid the kitchen and added sheetrock to both sides of that wall. These pieces of wood are a primary source of my lack of progress, for when I took my old heat gun to them, I found it took off the topmost layer of paint, then stopped. How futile and useless. So much for that heatgun. Besides, I could see from the back that they had a good many knots. Back then, I didn't want to mess with that. So I leaned them against the basement wall and intended to see if I could find some clear material to replace them with. Anyhow, today. I was down there today, and I thought, Well, those jambs off the front room have knots and I'm accepting them. Why don't I strip these kitchen-dining room facings after all and save buying n ew wood? So I did. One piece. With the belt and palm sanders, since the old heatgun had baked the lower layers of paint on so thoroughly not even the Western Wood Doctor refinisher could get it off. It looks lovely-- if you like knots, knots, and more knots. And now I'm thinking, Maybe not. If I'm going to obscure my lungs with sanding dust, I'd like to be rewarded with clear wood. This time, I think I'm going to be less thrifty with the gasoline and the cash buying new wood, and more sparing of the electricity and the effort. Now that my woodwork stripping in the front hall has given me an excuse to rip down bits and pieces of Beige Wallpaper, it's time for me to think about replacing it, throughout the first floor. 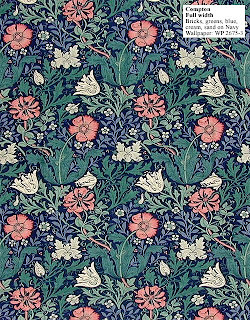 I've long since determined I want patterns from the William Morris line: the house wants the texture of wallpaper and the Morris works best. Now, some people would say, "The economy's going to hell in a handbasket; I won't bother with this wallpaper, I'll just use paint. In fact, I won't even paint my walls, I'll move out into a shack!" But me, I figure if I'm going to do this, I'm going to do it once and do it right. I'll be ordering directly from England: the distributors this side of the Atlantic impose hideous mark-ups, sometimes as much as 300%. When I checked my English sources on-line a couple weeks ago, O deer o deer, I found the per-roll price of these papers has gone up £6 to £9 since I first decided on them in 2003-2004. Good grief! Between that and the exchange rate, things won't get any more favorable to me if I wait. Besides, Sanderson Fabrics offers some significant price breaks if you order more at one time. But which papers and colorways will I use? 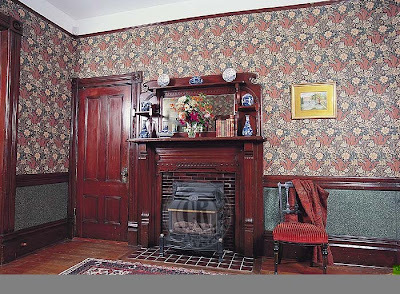 I've known for years what I want in the dining room: the William Morris "Savernake." It's got a nice overall design, it goes well with the Morris "Strawberry Thief" drapery fabric I got on eBay a year ago, and it's light enough to take advantage of what little light I get in that room. And that's important, because I do most of my reading sitting at the dining room table. 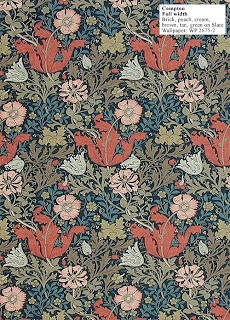 And in the living room, the William Morris "Owen Jones," in a rich red to pick up a color on a painting I did in college. For a long time I've liked the idea of a cozy red living room, and mine is open enough it won't be overwhelming. The front room, when its time comes, I'll paint a fresh sage green; there's not enough wall space in there to justify a patterned paper. The kitchen I did up with a sponged finish four years ago and it's fine. That leaves the stairhall, first floor and second. For the past four-five years I've lived with a sample of Morris's "Compton" propped up on a wall-hung cabinet, for my contemplation and consideration. I love "Compton," at least I love the fabric version of it. But is this paper too dark and too bold for my stairhall? What about the more blue-green colorway? 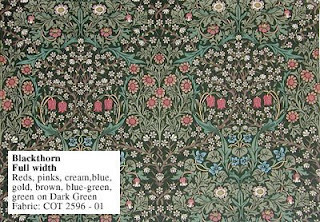 Or considering the whiff of Arts and Crafts medievalism I'm working towards with the encaustic-look tile I'm looking at, maybe Morris' "Blackthorn" would do better. It has a nice overall design, a little more to the scale of my stairhall. It reminds me of the border of an illuminated manuscript! 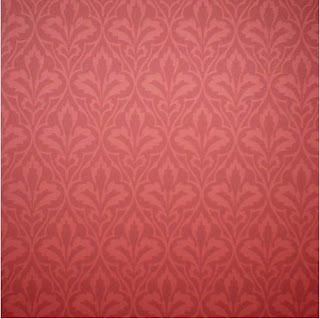 And I already have curtains for the upstairs hall window in the same pattern, not the same colorway, but compatible. But I wouldn't want "Blackthorn" all over. It'd get too dark and heavy. Maybe just on the lower part, with a new chair rail between and a lighter pattern (the Morris "Acorn," perhaps?) above. And end the "Blackthorn" (or "Compton" or whatever) on the wall at the top of the stairs, and use the lighter-colored paper on the rest of the upstairs hall. I've done some measuring and think it will work, but I'm working bit by bit on some elevations in AutoCAD so I can check for sure. I ordered my first batch of samples from Sanderson's Fabrics in North Yorkshire on the 23rd, and the second on the 30th. Between then and now I found myself poring over my old "Compton" and "Blackthorn" samples and obsessing over images of the designs that I found on the Internet. Which one, which one? I hated giving up the idea of the "Compton" . . . but then I came across this image on a Canadian distributor's site. And I'm now thinking uh, no, give it up, girl. I read on somebody's blog that William Morris actually favored large patterns for small spaces, but that doesn't mean I have to. Or can. So have I decided on the "Blackthorn"? Maybe, maybe . . . though this doesn't help! Though maybe that only applies to the red colorway. Both batches of samples have arrived. The "Owen Jones" is a clearer red than the sample I had before; different, not what I'd got used to, but good. The "Savernake" is a problem, as the current batch is definitely less creamy and more green than what I had before. I'm glad it's not pinky-beige, but is it really a good tint for a dining room? I called Sanderson's in Harrogate early this afternoon and arranged to send them a piece of my old cutting for matching-- I hope, I hope! And guess what: Turns out I inadvertently asked for a sample of an "Owen Jones" colorway I did not want, and forgot to request the "Blackthorn" I did. Or they made a mistake across the Pond. Either way, I'll need to wait another week or more for it to arrive so I can finally, finally make up my mind. 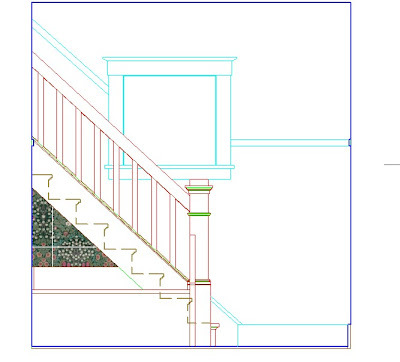 Meanwhile, I can strip more woodwork and get these stairhall elevations done so I can work out just how much of it I'll need. And pray that we don't all slide into some great worldwide economic abyss between then and now--or ever. Yeah, I know that if that happens, I'll have more to worry about than wallpaper. But somehow I feel like I'm snatching this opportunity like rescuing something precious from a burning building. I may get singed, but I have to try. If you read through my blog, you'll notice it's my dream and desire to replace the 21 year old metal insulated windows with new, historically-accurate-but-insulated wood windows. But with 27 windows to do, it just ain't feasible right now. So today I had the metal window technician over to look at them, to get what I've got tightened up for the winter, for the time being. Joy and gratitude! he was able to fix a couple of things today. The front window screen that refused to stay in when my cat lay against it, it just needed new clips and rescreening. Done. And the bedroom window sash that absolutely refused to close, turned out it had broken cams. Replaced, done. I'm now waiting for a bid to replace the two glazing units that've been fogged the past two winters already, and the broken sash rail on one of the windows in the front room. Hope it won't run to too much. But if I'm stuck with these windows for awhile, things are already better. For the time being. I've been working the past couple of days on stripping the casing and sill of the portal between the stairhall and the living room. Not steadily: the laundry and life have to be attended to some time. The sill is interesting, since it evidently is a piece cut down and reused from somewhere else: Finished under the paint on both sides and one end but innocent of stain or natural finish on the long edges and the other end; with an unfinished breadth that shows where it once received some 2x member. No conception what it could have been; maybe someday I'll ask my PO-1. But it left me the problem, how to even things out. Aha, guess this is a job for the belt sander my mom and stepdad bought me for my birthday over a year ago, a tool I used for the first time only a few days ago. Well, the belt sander took care of that one area. And evened out some bad scratches. But now I have to figure out how to get rid of the ditches my novice sander-handling technique has left in the wood . . . and I don't think calling the piece "interestingly distressed" will satisfy. I'll deal with it tomorrow, when I'm less tired. This past week, I did work in a few more hallway trim pieces stripped, so I'm up to 119, a little over 35%. I won't count the four I was working on this evening until they're totally done. Which-- see paragraph above-- ain't happening tonight.